St Simon's Church is usually open during weekday mornings and during service times. For further details phone the Church Office on 023 9282 9440. 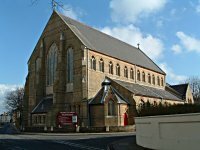 Car parking is available on some of the streets adjacent to the church - you are most likely to find places on St Simon's Road or St Ronan's Road. There is no parking on Waverley Road. Until 1851 Southsea was a part of the Parish of Portsea, but as the spread of housing increased it became necessary for Southsea to have it's own parish. At that time the most prominent architect in the town was Thomas Ellis Owen and it was he who paid for the construction of a new parish church at St. Jude's in Kent Road. Such was the expansion of Southsea however, that St Jude's quickly became overcrowded and further churches were planned. The first of these was St Bartholomew's which was bombed during World War 2, but remained in use until 1958. It was sited at the junction of Outram Road and Campbell Road. Whilst the church was being constructed, a temporary church was put up close by. This was alleged to have been a former mobile hospital building brought back from the Crimean War and was known as the Crinoline Church on account of it's circular shape. Once St. Bartholomew's had been completed the Crinoline church was moved to take up temporary residence on a piece of land just north of the current site of St Simon's Church where it occupied a similar role whilst St Simon's was under construction. The distinctive circular outline of the church can clearly be seen on the 1861 Ordnance Survey Map of the area. When no longer required on this site the Crinoline Church was moved to Eastney Barracks where it served out it's useful life. The prime instigator for the creation of St Simons was Reverend Baldey, who used much of his own money for the construction. He had formerly been curate at St Judes, but as Southsea grew, he had recognised that the eastern part of the town would be in need of a church. By the 1860's the urban spread had reached Victoria Road South and was growing northwards from South Parade. The new site for St Simon's was located on the edge of farmland where it met the northern edge of the growth from the south. The church itself was consecrated in 1868.